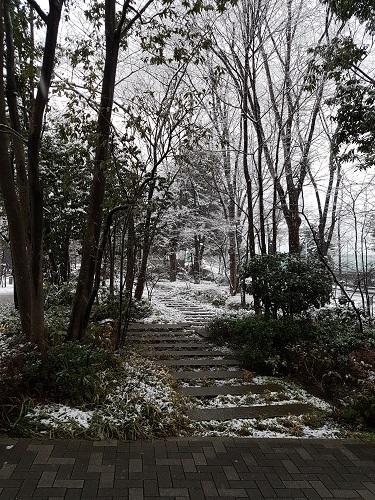 According to Japan Today, the Monday, January 22nd snowfall in Tokyo was the heaviest since 2014. Because I walk and the snow started sticking after International Class, I escaped rather unscathed. Unfortunately, I had to cancel an evening with a friend as it wasn’t worth venturing out with the crush of millions trying to get home on delayed trains. I caught an early bit of it in the grove outside my apartment, but by the time several centimeters had come down it was too dark for photographs. I cranked up the air conditioner, turned on some tunes and called it a night. The next morning the sun was out again. Roadways and sidewalks were slushy. 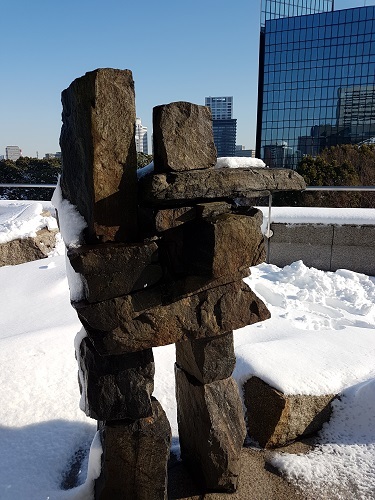 People in Tokyo cope with snow about as admirably as we do in Victoria and Vancouver. Some shoveled, some did not. Then when temperatures dipped, those who hoped for Mother Nature to do the work are now chipping hard ice from the sidewalks. 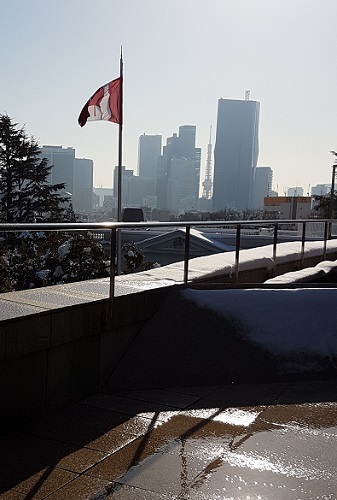 On the way to school I paused at the Canadian Embassy which was not yet open. I asked the guards whether there might be snow on the rock garden and whether I might have permission to take a few photos. Sure. Go on up. They looked over my passport, I signed my name at the top of the day’s list and took the escalator to the fourth floor. For a week now the whirl of leaving has been in full swing—the last four classes this week, good-byes to teachers and classmates, dinners with friends, arranging to ship luggage and beginning to pack my suitcases. Special moments and floral designs will eventually will find mention here. Right now there’s little time. Yamato transport will be picking up my large suitcases for transport to Narita this afternoon. I’ll pick them up before flying out on Saturday. Suddenly in a shattering dissonance that sometimes happens without warning, I stood with a view of the Canadian flag ahead of me. Tokyo Tower stood sandwiched between two high rises in the hazy distance. Behind me lay Shunmyo Masuno’s marvel of art and engineering representative of the Canadian Shield covered in snow. In that moment I was both home and about to fly away; away and about to fly home. 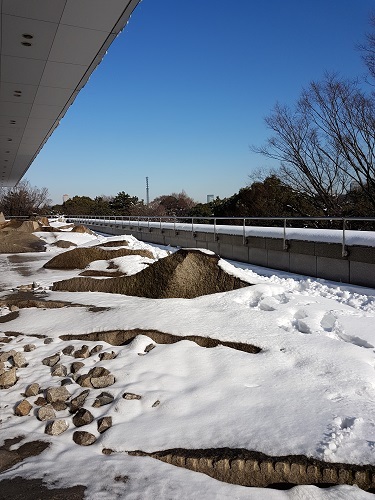 This entry was posted in Japan, Travel & Culture, This & That and tagged Heavy snow in Tokyo 2018, Snow in Tokyo. Bookmark the permalink. Thank you for your wishes, Pat. I value my faithful readers. Though it’s bittersweet, I am looking forward to the comforts of my Canadian home and settling in to recount the numerous stories still untold.